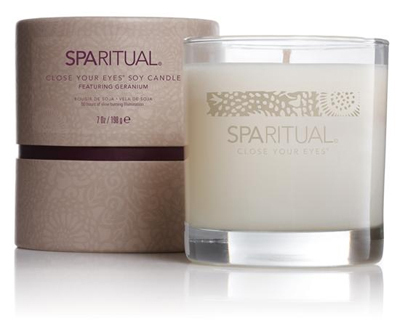 Light up your surroundings with a scented soy candle from SpaRitual which are blended with pure essential oils and carefully selected plant essences. Each candle is gracefully hand poured into an elegant recycled glass jar and features a 100% cotton lead-free wick for up to 50 hours of fragrant illumination to perfectly enhance your daily life for slow living. Includes natural soy, palm and coconut wax. Packaged in a gift box with the SpaRitual logo. Choose from four fragrances.